We have been running trips to Yellowstone National Park as an approved photography tour operator there for many years now and it is without doubt one of the most beautiful locations on the planet and during the winter months turns into a winter wonderland. The challenges its wildlife faces in the deep cold of winter are well known. After some initial days exploring the world famous Lamar Valley in search of its wolf pack, Bison, Red Fox, Elk and dramatic landscapes we will board our own privately-hired snow coaches with drivers and access the heart of the park. Closed throughout the winter months, we will have a privileged opportunity to explore the park with a decent degree of comfort and tranquility. 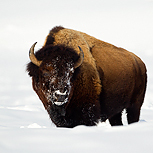 We’ll look to capture the harsh challenges this tough season brings to the landscape and inhabitants of the park, from the iconic Bison, Coyote, Tundra Swans and Bald Eagles along with some dramatic geysers such as Old Faithful (where we will also be staying) and a true winter landscape. This is an amazing photographic opportunity for the lovers of what this unique season can offer in one of the world’s truly dramatic settings. Day 1: A day of travelling as it’s a long flight to Bozeman airport in Montana and you will not be arriving until the evening. We will then transfer to the local hotel for a well needed first nights rest. Days 2-4: After a long day travelling on the first day we will have a leisurely breakfast at 9.00am at the Best Western. After breakfast we will transfer ourselves to our base for the next 3 nights, which will be the Absaroka Lodge in Gardiner, a small town on the edge of Yellowstone National Park. From here, and using the large vehicles we have at our disposal, we will look to explore and photograph under our own steam the dramatic settings, scenery and wildlife along the Lamar Valley, the only area of the park open to the public during the winter months. 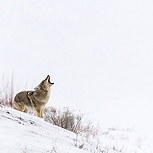 The valley is one of the best places to see wolves during your time here, (there are several territories that the road cuts through), and they are attracted to this area because of the large groups of elk who gather in the northern reaches of the park. You will also expect to encounter bison, bald eagle and coyote as well as plenty of landscape, scenic and macro winter opportunities in this 40 odd mile long valley – there’s plenty to explore. Day 5: We will drive back into the park and leave our vehicles at Mammoth where we will transfer to the snow-coach that we have at our disposal for the next few days. We will head to our base for the next 3 nights at Old Faithful Snow Lodge; we will again be looking for wildlife en route. (Our guide/driver will be up-to-date with what’s happening and where in these otherwise non accessible parts of the park that species like bison, elk, otter, bald eagle, red fox and trumpeter swans can be found). We will certainly be looking for scenic opportunities at Roaring Mountain and Norris Geyser Basin en-route. Days 6-7: Although there will and has to be a degree of flexibility with this based on what we’ve achieved to date and want to prioritise, our potential programme for the next couple of days should include a day travelling over Craig Pass and photographing along Lake Yellowstone, the Hayden Valley and Grand Canyon of the Yellowstone, and another day exploring Upper and Lower Geyser Basin. Whilst we are based at Old Faithful Lodge the geyser itself is an obvious additional target, and the geysers generally are the main attraction for bison too, so steam and bison combinations will be high on the wish list for sure. You should also have the opportunity (given some clear overnight skies) for some low light long exposure photography here too – the paths are not lit though so bring a torch if you’re interested in this option. Day 8: We’ll look to prioritise areas we want to revisit and work on as we begin our snow coach trip back to Mammoth for the cars and then the drive back to Bozeman where we will once again stay at the Best Western near the airport before your flights home the next day. Day 9: Return flights to Europe, but please note that we won’t land until the morning of Day 10 on 29th January. Accommodation, all transport to/from Bozeman airport, all meals, and soft beverages. International flights to Bozeman, alcohol and sundry items. Accommodation is based on a twin/room basis dependent on which hotel/lodge we are at during our travels. It will all be typically comfortable US accommodation.